"Once upon a time, an angel and a devil fell in love and dared to imagine a world free of bloodshed and war."" ""This is not that world."" "Art student and monster's apprentice Karou finally has the answers she has always sought. She knows who she is--and "what" she is. But with this knowledge comes another truth she would give anything to undo: She loved the enemy and he betrayed her, and a world suffered for it. In this stunning sequel to the highly acclaimed "Daughter of Smoke & Bone," Karou must decide how far she'll go to avenge her people. 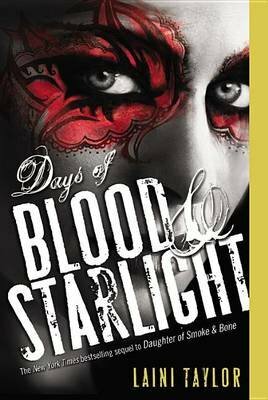 Filled with heartbreak and beauty, secrets and impossible choices, "Days of Blood & Starlight" finds Karou and Akiva on opposing sides as an age-old war stirs back to life. While Karou and her allies build a monstrous army in a land of dust and starlight, Akiva wages a different sort of battle: a battle for redemption. For "hope."